I am constantly changing the pillows and accessories in my living room and it really does change the look of the room. It's always fun to look back and see what all was going on in 2011. One of the first changes last spring was to make some blue and yellow pillows, and use some of the blue and white decor that I had found at GW. Summer brought some totally different colors. 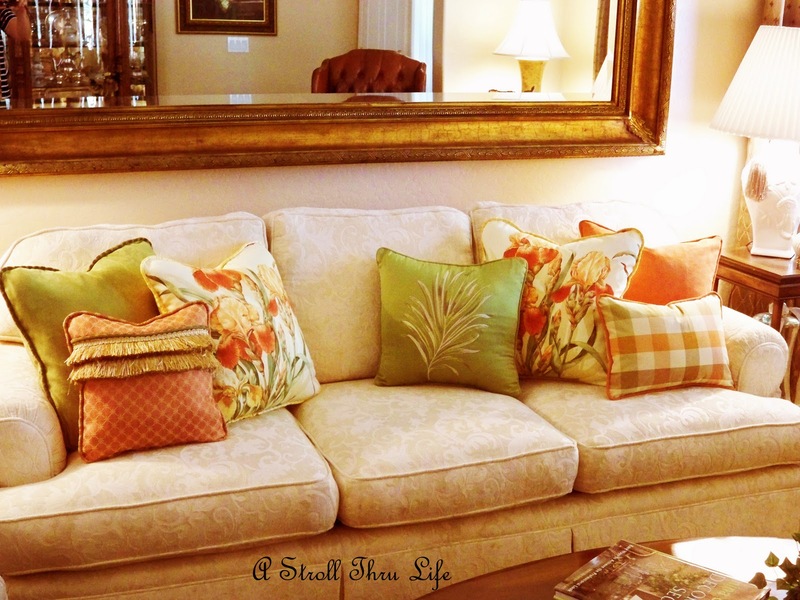 I had a new sofa and some orange and green pillows for a vibrant summery color scheme. Fall arrived with a few more changes. This time I added some brown crewel fabric to the orange mix. 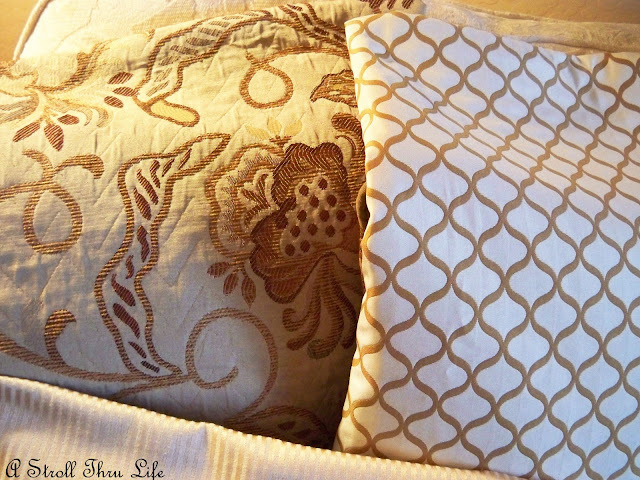 Winter came with the revival of some old pillows in a dark peach, taupe and chocolate. I always start to long for a clutter free and calm space when Christmas is over. So my mind is spinning around looking for a new color scheme for the new year. I love this piece of fabric, the pattern and color is wonderful and since it is reversible, the possibilities are endless. I dug around through my stash and found a couple of other fabrics that will coordinate really well with it. I love this heavy embroidered piece. A simple stripe always works with multiple patterns. 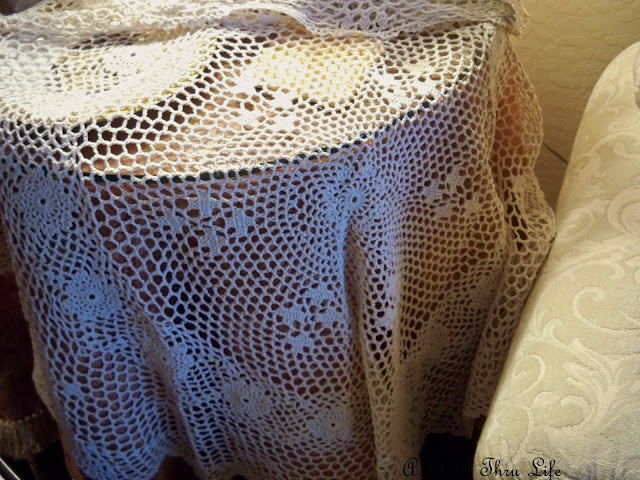 I found this lovely crocheted table topper, maybe layered over a simple cream cloth. This is a good start, now I just need to find some trims and possibly another fabric and I will have a totally new room for the new year. How about you, are you ready for something totally different for the new year? I have to get my husband reading these blogs. He thinks I change way too often (which isn't true). Let him see that other women like change too. The fabrics are pretty. 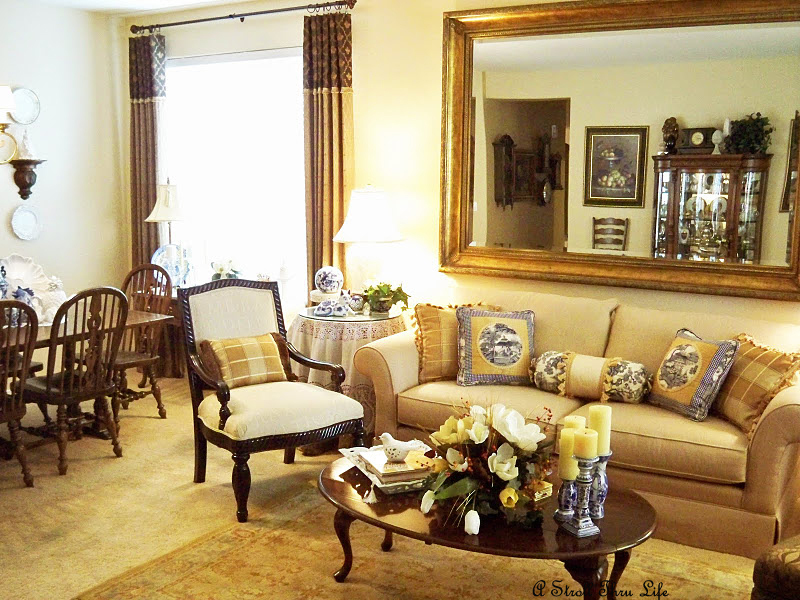 I will be showing pics of our new livingroom very soon. It is really different than what I am use to, but I love it. Change can be good. Marty, each look was just lovely! 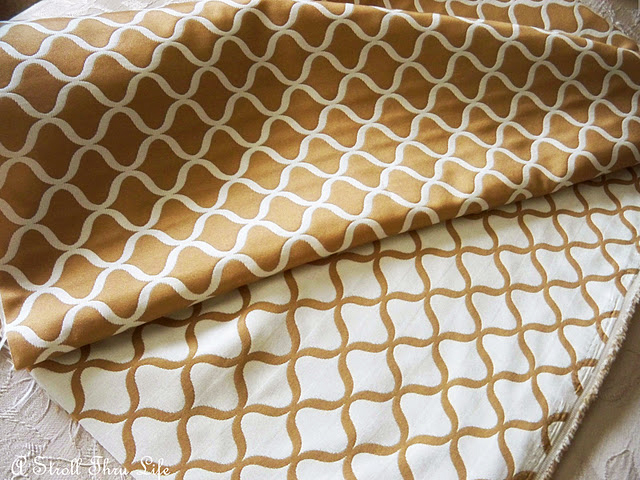 I love your new fabric and I know you'll create a remarkable new look! How fun! Oh my, that reversable fabric would be perfect for my room too. I have the ideas, but have to take myself out to shop for fabric cause I'm not finding what I want nearby. I love the combination you have there. YOU BETCHA! Well...I just want to relax and enjoy the new colors that really haven't been enjoyed without all the Fall decor and then all the Christmas. So - clean and uncluttered for a while is perfect for January! I found the trims I bought at your store last Spring, I never made the pillows before I changed the color scheme and now...not sure what I'm going to do with them! I'm ready to organize my organization! LOL! By the time I get through the holidays I feel like everythings such a mess. That's what I'm looking forward to doing in January. And of course projects as well! I have a long list of to-do's. I'm so impressed by your seasonal changes! They're all lovely looks, Marty! Can't wait to see it finished! I always love stopping by to see yur new additions to your beautiful home Marty! I am looking forward to seeing all the new pillows. You always make them so beautifully. You've inspired me to make a few myself. I've been needing to do that for awhile. 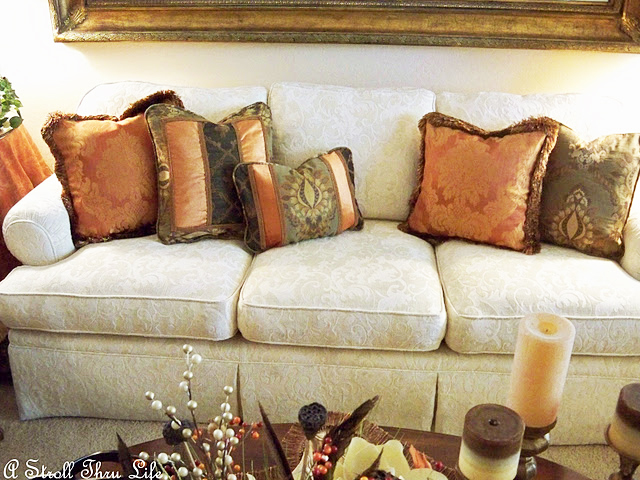 having your creamy sofa lets you make some great choices throughout the season. Here is to hoping in 2012 my husband paints my living and bedroom! You were so smart to get a cream colored sofa that allows you to change out pillows each season. I'm with you...after Christmas I need a new look and things calmed down. We are taking down all of the Christmas stuff on new year's day. I love the new fabrics. Can't wait to see the pillows you make out of them. You have a great eye for combining textures and fabrics! I love all the fabrics, but especially the embroidered one. Can't wait to see what you do with it. Marty I am so ready for a new look. I am going to change my mantle first. I am taking the Christmas decor down on Saturday. Then I am going to shop my house for a new look for our fireplace mantle. Will post it when I get it all done! Happy New Year! Lovely combination - love it! It will look marvelous just like all of your changes. Lovely fabrics, Marty! 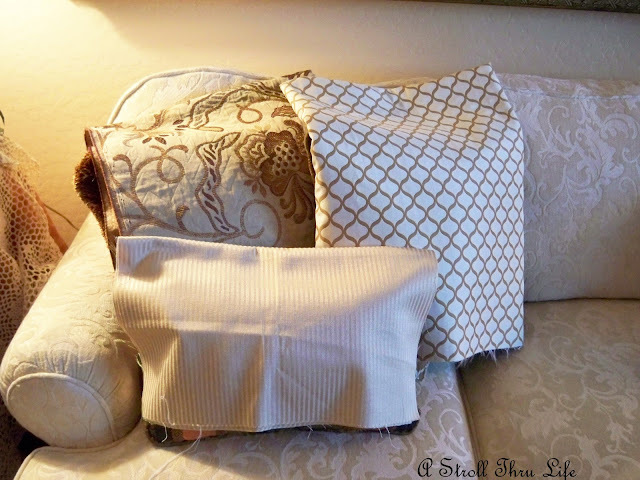 I love changing out pillows for a new look myself. I hope you have a wonderful New Year! Oh, I probably won't deviate much. But I love those fabrics you've chosen! Gorgeous pillow from 2011! NOW...the possibilites are endless with these lovely fabric choices! I can hardly wait to see your creativity unfold before our very eyes! I'm sure I'll be pleasantly surprised...on with the reveal! Can't wait to see the new look. Those are some gorgeous fabrics. Marty....It always looks great around your place. I do not know how your white sofa always looks so new. If I had a white sofa, I can promise you that it would not look so clean..
Marty, All of your looks are just beautiful. But I know how your feel, when the holidays are over you want to lighten up a bit. I know that is how I feel right about now. I do love the new fabrics that you've chosen. Can't wait to see what you come up with! Just had to stop by and wish you a Happy New Year and then I see your lovely fabrics--wow! Good luck with your project. Change? Are you kidding..? With 7 children, their spouses, 14 grandchildren and 5 greats...nope. No changes. Wait! Yes, yes indeed a change. I changed when I bought two new chairs of a totally different color. From gold to a deep red/cranberry color. Lovely! I love you gold with the blue..blue and white is always so beautiful with anything. That is going to be beautiful! Happy New Year, Marty! 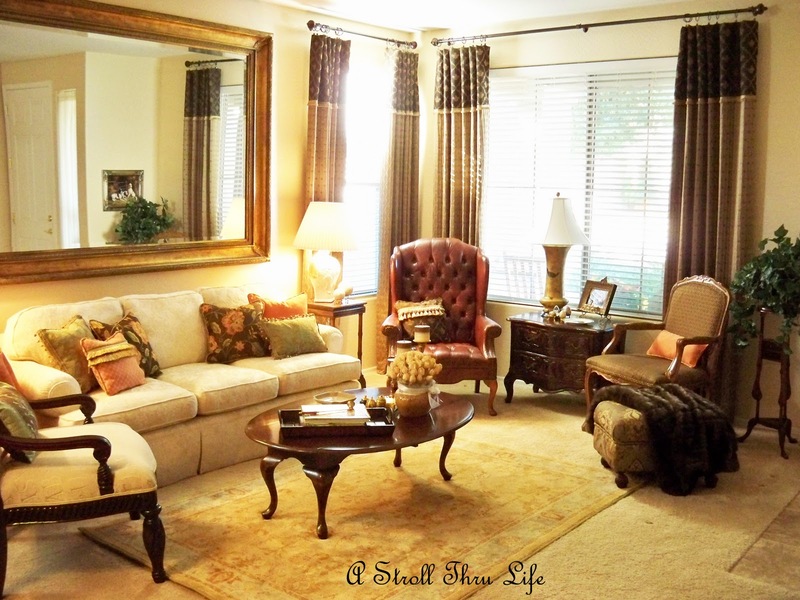 I am so loving how you can always change your living room look with pillows and accesories! 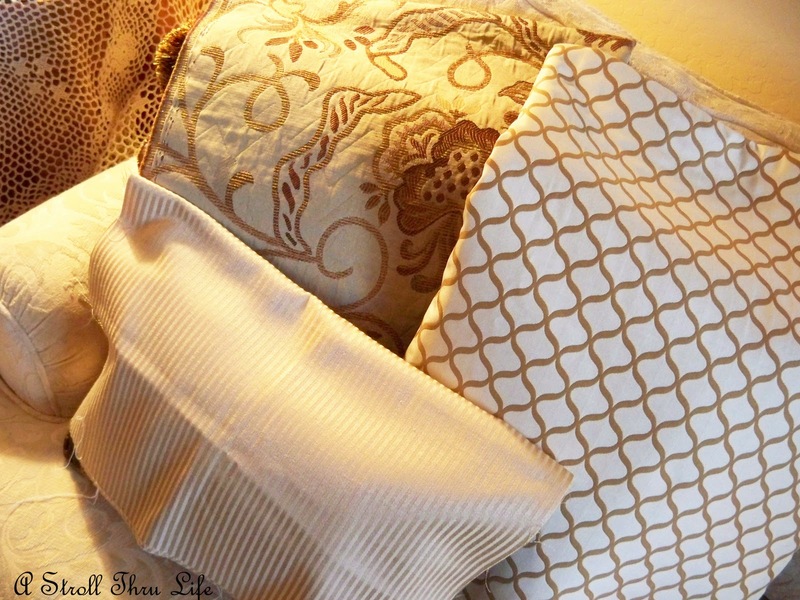 Those new fabrics are gorgeous and I can't wait to see how it turns out! I know when I can afford a new couch I am going to go neutral like yours! Oh gosh I can't hardly wait to get back out there...I will keep you updated! I am waiting to see if my bro and wife rent a condo in March for all us. Otherwise, I am coming sooner! Big Hugs and Happy New Year too! I think those are lovely choices. Looks like a lighter creamier pallet you're going in. Isn't it nice to have neutral furniture to work with? I'm sure you'll have lots of fun changing it up. I am continuing in my lighter look too. Nice fabrics. Happy New Year! I can't wait to see when you finish the pillows. I love the fabrics you had in your stash they go so well with the one we purchased that day. Marty your home is always so lovely-I so enjoy seeing your ideas-Have a wonderful happy and healthy new year! I'm most definately ready for a change too! I love the fabrics in your last picture, but then I'm loving all things neutral. We'll be starting a big change in our den shortly and I can't wait!